How are you? Thank you for all your emails and New Year wishes. Happy New Year to you. I feel very excited about a series of new studio workshops coming soon in Gretna as well as new ecourses coming to my website for you to experience in your own time. I'm an Intuitive Artist & Creative Therapist based in S W Scotland offering intuitive art courses online and in my garden studio for Health & Well Being. As well as my life long love of art making, I bring my extensive background in Counselling & Creative Therapy, Training, Group Facilitation & Mentoring over the past 19 years, along with all my life experience. I'm passionate about the healing power of making Art which is why I created my Art Courses for you to experience. Anxiety, Stress, Depression and Anger can be transformed into a sense of peace, joy and deep relaxation whenever we create art. Making Art is 'Medicine' which I take daily for my Well Being and love to invite others just like you to experience either online with me or in my garden studio. All that I do, almost didn't happen however! Aged 16, I desperately wanted to go to Art College. I wasn't allowed to go and was sent to Secretarial college where I could "learn skills that would earn me a good living". Being a 'good girl' I didn't argue and did as I was told, however, I never stopped sketching, colouring, doodling and at that time making art with clay. In 1996 I realised with great excitement that my love of Art could be combined with all that I was learning in my Counsellor training. During my 3rd level, Diploma in Counselling, I began to offer creative art courses in community centres and witnessed the relaxation and stress reduction in the participants. My first ever course; 'What Kind of Tree Am I?' was such an amazing experience. 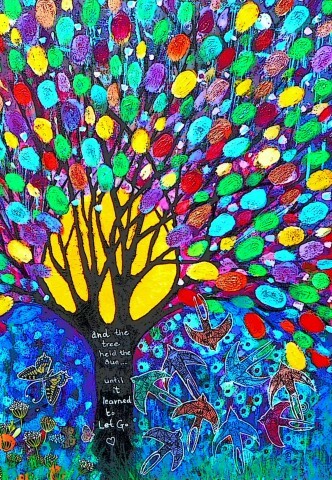 I watched everybody's unique Tree emerging on canvas, telling their life stories and offering healing. As well as painting we shared our stories, laughed and cried and everyone went home with their beloved Tree painting, feeling chilled out. They would be reminded of all they had learned every time they looked at their painting.. Through the process of making Art and listening to our inner voice, we can develop greater self awareness, Intuition, Self-Acceptance, Confidence and experience Anxiety & Stress melting away. This is very good news for our Nervous System which is very often over-worked and over-stretched, often close to burn out. I believe we are all Artists, creative in the core of our Being. Think back to Cave person days... all that amazing self expression of life back then. Art is a mirror, it speaks To us and For us, teaching us what we most need to know. Making art helps us to peel back the layers of Adaptation & Conditional Worth to become happier and calmer within. Art allows a deep connection with one self and this is one of the greatest gifts we can give ourselves. Self acceptance and how we talk to ourselves can make or break us. When we begin to truly see and hear ourselves, this impacts our relationships at home, at work and in the wider world. I believe this helps improve our World and brings with it Soulful, meaningful Art that touches ourselves and others deeply. If you would like to be kept posted about painting days in my garden studio or find out more about my exciting self paced ecourses get in touch or visit my Art Courses page here on my website.